The Gaia principle (named after the Greek word for Earth) has taken on a lot of new agey, pseudo-religious connotations. We hear about life forces, Mother Earth, and the spiritual connection we humans have (or ought to have) with our planet. That’s all very interesting, but let’s set that aside for now. As a scientific concept, the Gaia principle or Gaia hypothesis is primarily credited to James Lovelock. In the 1960’s and 70’s, while working for NASA, Lovelock wanted to understand why Earth is so tailor-made for life while other planets, especially Mars, are not. According to Lovelock’s hypothesis, once life takes root on a planet, it fundamentally changes the environment around it. As life evolves, so too does the planet, with the planet’s environment becoming increasingly favorable to life and life becoming increasingly well adapted to the planet’s environment. Today, all life forms on Earth exist in a symbiotic relationship with each other and with the planet, actively (though unwittingly) maintaining the planet’s life-friendly conditions. It’s almost as though Earth has become a single organisms with countless individual “cells” working to maintain homeostasis. A strict interpretation of the Gaia principle would tell us that if life fails to alter its environment, if it fails to spread out and establish a vast and complicated planetary biosphere, then it will wither and die. Scientists are currently searching for evidence of life on Mars. Specifically, they’re looking for microbial life eking out an existence, perhaps only in one limited region of the planet. Whether or not we accept the Gaia principle and how strictly we choose to interpret it has major implications for what we can expect scientists to find on Mars. Because if it’s all or nothing when it comes to life on other planets, as the Gaia principle suggests, then Mars looks pretty darn close to nothing. So what do you think of the Gaia principle, and how likely do you think it is that we’ll find life on Mars? Today’s post is part of Mars month for the 2015 Mission to the Solar System. Click here for more about this series. Posted by J.S. 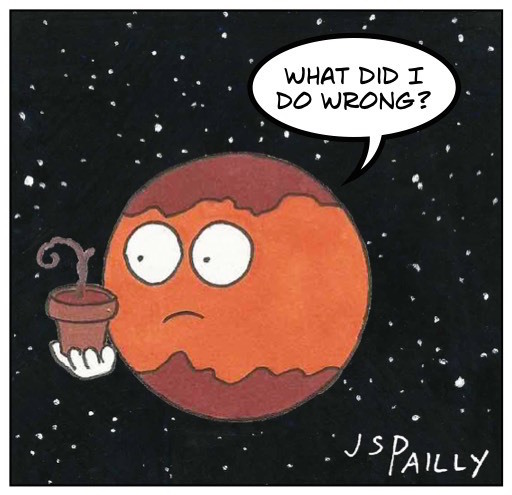 Pailly on June 5, 2015 in Mars (2015 Mission), Mission to the Solar System, Sciency Words. I find a lot to agree with in the Gaia principle. In recent years, I’ve become much more aware of just how dependent we are on our biosphere, that we are essentially components of it, and how much of a challenge it will be to live away from it. I agree with a lot of it too, although I keep wondering how seriously to take it since we really only have a sample size of one planet. Oh, I agree. I was really only addressing our biosphere. But yes, alien life may not be as dependent on theirs as much as we are on ours. And, of course, once you start talking about engineered life, all bets are off.